Richard Hadlee had likened a delivery to a 'question' posed by the bowler to the batsman. To me, no one answered this 'test' better than Sunil Gavaskar, says M P Anil Kumar. In cricket, nothing quickens the heartbeat more than the sight of a fast bowler steaming in to knock over the batsman. The full-stride, at-full-tilt run-up of tearaway speedsters Jeff Thomson, Dennis Lillee, Malcolm Marshall, Michael Holding, Garth Le Roux, Imran Khan and Shoaib Akhtar really filled you with adrenaline irrespective of whom you rooted for. Richard Hadlee had likened a delivery to a 'question' posed by the bowler to the batsman. To me, no one answered this 'test' better than Sunil Gavaskar. He had the antidote to defuse the venom of the pacemen, the technique to negotiate the short-pitched stuff. He never looked ungainly while swaying/ducking the bumper or blunting the snorter aimed at the throat or ribs; in fact, doing that too spelled E-L-E-G-A-N-C-E. In sum, he never danced to a pace bowler's 'chin music'. Besides, he was blessed with the flair to drive the ball with kingly majesty. Very few things have given me greater joy than watching/hearing him take on some of the fastest bowlers the game has seen, with guts, without the now ubiquitous helmet. And, may I add, he was as adept at playing the spinning ball. In my humble impression, he's the best Test batsman within living memory. Of course, then the Test matches were played at a different pace (pun intended) and environment. 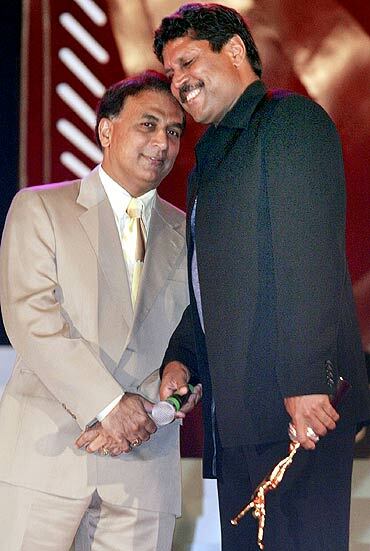 As we know, Gavaskar, the Test run machine, rarely set the Arabian Sea on fire in the limited-overs format. Barring a stodgy 55 against New Zealand in 1979, he made little impression in the first three editions of the World Cup. In fact, he invited scorn for his unbeaten 36 (174 balls) against England in 1975. Even when India won the Cup in 1983, his presence was kind of talismanic; India won all the matches he played, and lost the two he did not. But an innings that preceded the World Cup had, unarguably, lent psychological impetus to the World Cup campaign. Please click on Next to read further. M P Anil Kumar, a former IAF fighter pilot, will contribute columns throughout the World Cup. Before heading to England, India had toured the West Indies in the summer of 1983. In an ODI contest on March 30th at the Albion Sports Complex in Berbice, Guyana, Gavaskar tackled the dreaded West Indian pace quartet with his characteristic panache, and nearly became the first one-day centurion for India. His 90, and Kapil Dev's muscular 72 (38 balls), enabled India to amass 282 for 5 in 47 overs -- their highest score in ODIs till then. Despite half-centuries by Vivian Richards, Faoud Bacchus and Jeff Dujon, India won the match by 27 runs. The psychological lift earned from this unlikely victory in the lion's den was what infused confidence and pluck in the team, the belief that they can beat even the all-conquering West Indies. Which they did twice in England, and won the most coveted trophy in cricket. Cut to the 1987 edition. An aside: The manufacturers of Bush TV gave us the first whiff of commercialisation of the gentleman's game; they announced rewards of Rs 500 for every boundary, and Rs 1,000 for every sixer hit by the Indian players. One-drop batsman Navjot Sidhu, till then derided as 'Strokeless Wonder', transformed into 'Sixer Sidhu'! This metamorphosis had nothing to do with Bush TV. October 31. Australia was topping the group with five wins. The second placed team in the group of four would play the semi-final against Pakistan at Lahore, which India wanted to avoid. To pip Australia, India had to win the last round robin match against New Zealand at a rate of 5.25 runs per over (then neither Net run rate nor Messrs Duckworth and Lewis had entered the cricket vocabulary) at Nagpur. India restricted New Zealand to 221 (Chetan Sharma took the first hat-trick in the World Cup by clean bowling Ken Rutherford, Ian Smith and Ewen Chatfield), which meant the target had to be chased in 42.2 overs. In pursuit, the Indian openers Srikkanth and Gavaskar launched a fierce two-flank assault on the Kiwi bowlers. They belted fours and sixes. Despite the mauling, Kiwi medium-pacer Willie Watson did not lose his sense of humour; he reportedly remarked to his skipper Jeff Crowe that he felt as if he was bowling in the highlights capsule! 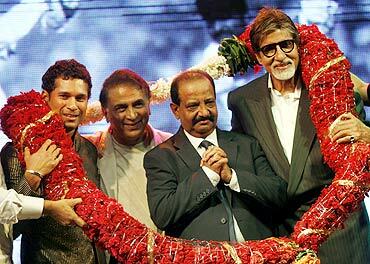 Gavaskar had publicly said that before hanging up his boots he wanted to score a half-century faster than Srikkanth did. He did exactly that and fulfilled his desire at Nagpur. Srikkanth perished after smacking 75 runs in 58 balls. Azharuddin joined Gavaskar, and both kept up the momentum, and India overran the Kiwi total in mere 32.1 overs, to set up a semi-final clash with England at the Wankhede Stadium, where Graham Gooch 'swept' India out of the Reliance World Cup. Gavaskar scored a century -- his only one-day century -- in what turned out to be his penultimate innings for India, in 85 balls. En route to his hell-for-leather undefeated 103, he was on course to break the record for the fastest century in the World Cup -- the 82-ball century by Clive Lloyd in the final of the 1975 World Cup -- but an inspired Danny Morrison spell baulked him. Had he earned the fastest century record, would it have made amends for his slouchy 36 not out in the 60-over match? To paraphrase Shakespeare (Macbeth), there's not enough water in all of Neptune's oceans to cleanse him of that blot. 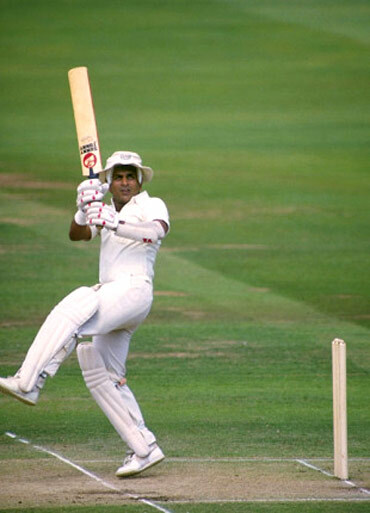 Berbice and Nagpur showed us what Gavaskar was capable of even in the one-day format. Between Berbice and Nagpur, alas, decisive knocks were few and far between. Given Berbice and Nagpur, like me, I'm sure the legion of his fans are still wondering what might have been.